Thanks to the mass production of the automobile, the building of the interstates, and the formation of our national parks, America has become a nation with a rich and enduring car camping tradition. And for as long as folks have loaded up vehicles and set a course towards the mountains, eating well has been an integral part of the experience. With a bit of forethought, culinary ambition, and the right camp kitchen setup, there is nothing to stop you from cooking like a pro and eating like king. When considered in the context of today’s fast-paced world, going gourmet and eating well in the outdoors is more pertinent than ever. If you’re chained to a desk five days a week and you spend your evenings in pursuit of your outdoor passions, you know that finding the time to cook well can be a nearly impossible task. When the weekend finally rolls around and you decide to drive up a quiet mountain road, turn off your cell phone, and set up camp next to a winding creek, you afford yourself the time to cook better than you probably do in your home kitchen. In addition to the simple pleasure of eating well, balanced and nutrient-rich meals are essential to athletic performance whether your plans include cruising mountain bike trails or battling your way up multi-pitch rock climbs. The first step to assembling a killer camp kitchen is designating a chuck box. A chuck box can be as simple and economical as a large plastic tote or as complex as a hand-crafted wooden box (DIY tutorials are widely available online) complete with fold-out tables, equipment-specific compartments, and removable legs. The function of a chuck box is to keep all your cooking essentials organized and stored in the same place. That way, when you make an impromptu decision to load up the car and head to the hills, you can simply grab the chuck box and know you’ll have everything you need (excepting your stove, table, and well-stocked cooler) to whip up a tasty meal. A reliable stove system is central to every serious camp kitchen, and we’re not talking about the lightweight backpacking variety. 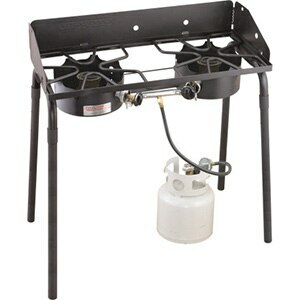 Depending on the amount of packing space in your vehicle, you can decide to go with a compact two-burner system that runs on a one-pound propane canister or you can equip yourself with a larger and more powerful two- or three-burner system that runs on a standard 20-pound propane tank. Generally, you just want to make sure that each burner on the stove you select puts out at least 10,000 BTU/hr, which is the average output of a household stove burner. A number of the larger models that run on standard 20-pound propane tanks will crank out an impressive 30,000 BTU/hr per burner, providing you with an immense range of culinary ability. Many models can also be accessorized with grill boxes and griddles, which make serving up a stack of pancakes or juicy T-bone steaks a simple task. 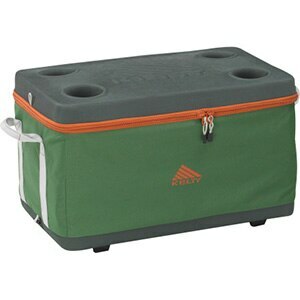 A quality hard-shell cooler is essential for eating well in the outdoors. While a soft-sided cooler may suffice for quick trips, a hard-shell will insulate far better and protect your food from being crushed in a fully packed vehicle. Unless you chop veggies with the lightning speed of an Iron Chef, it’s a good idea to plan meals and do prep work before leaving home. You can then label your sealed bags of pre-chopped veggies and meats specific to each meal, which allows you to start cooking with minimal prep time. If you plan on packing lots of canned and bottled beverages (which you should), consider bringing a second beverage-specific cooler. Beverage coolers are opened and closed frequently, which allows chilled air to quickly escape. If your food is stored in a separate cooler that is opened less frequently, your temperature-sensitive foods will stay chilled for a longer period of time. Regardless of how much prep work you accomplish at home, there will still be food prep tasks that will need to be done in camp. For this reason, we recommend bringing along a sturdy camp table, and if you’ve ever struggled to balance a cutting board on your lap, chances are you’ll agree. 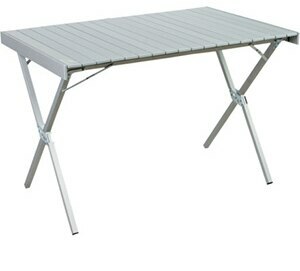 A fold-up camp table is a great option, especially if your vehicle has limited packing space. If you happen to drive a pickup, a piece of plywood or a cutting board on your tailgate should do just fine. From quiches to casseroles to hot apple pie, a Dutch Oven will allow you to bake just about anything you might stick in your oven at home. 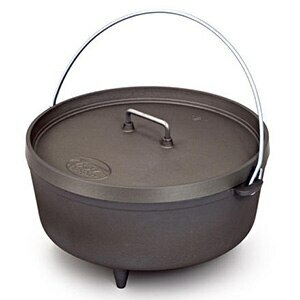 With a well-seasoned Dutch Oven added to your kitchen setup, you’ll have the versatility to prepare a much wider range of dishes, especially of the gourmet variety. The prized virtue of a Dutch Oven is its ability to evenly distribute heat, allowing you to cover it with charcoal briquettes, position it in hot coals near an open fire, or place it on the stove top. Some models even feature a deep dish lid that can double as a skillet. If you properly care for your cast iron cookware, which involves never cleaning it with soap and making sure it is fully dry before storage, your cast iron will eventually acquire a natural non-stick cooking surface that’s referred to as ‛seasoning’. Seasoning results from oils penetrating the surface of the cast iron over time, which will create a non-stick patina surface that’s wonderful to cook on. Not only is cast iron cookware revered by chefs of every discipline today, it’s been a staple of the outdoor kitchen for hundreds of years. 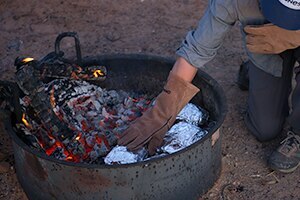 If your chosen campground permits an open fire, don’t be afraid to try some good old fashioned fire-roasted grub. (Not to mention, a hot bed of coals is ideal for use with your Dutch Oven.) Stick-roasting edibles is fun and delicious, and it has been around since man discovered fire and realized it could do wonderful things to meat. Another great option for open-fire cooking is the use of aluminum foil. With a thoughtful array of fish, meats, veggies, and spices, fellow campers can assemble a foil dinner to their own liking and be personally responsible for cooking it.